Malware warnings: false positives. 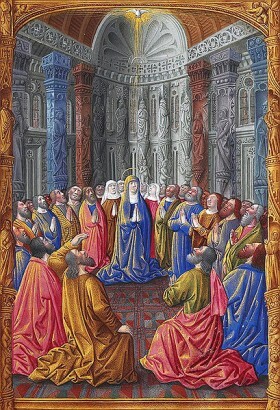 And Happy Pentecost Monday! I am VERY happy to report that we have identified the source of the virus warnings some readers were getting while visiting this blog. The site itself is clean, as we thought, but a line of code had been embedded into my footer in early May to ward off the effects of the worm that had infected thousands of sites hosted at Godaddy. It was that protective script which, paradoxically, set off anti-virus programs and triggered those alarms. My very special thanks go to David at Sucuri Security and Mike at Planet Russell for giving my site much personal attention yesterday, on Whit Sunday too. This code has been removed, but we will continue combing the site for any remaining triggers. 2. This site is now monitored on an hourly basis by Sucuri Security. Most of all, I wish to thank those readers who alerted me to the anti-virus warnings. If these crop up again, please let me know. And happy Pentecost Monday! The illustration is by Jean Colombe, from the Très Riches Heures du Duc de Berry.